Ample Vape out of Shenzhen is not a company we have heard a lot about. But someone over there is trying something different and we applaud the effort. The big news about the Mace-X is the coil design, it’s a horizontal mesh coil that offers a ton of surface area that should translate into lots of flavourful vapor, and it does. The rest of the design and aesthetics of the tank are nothing out of the norm. It is a top airflow and top fill tank which should make for worry free (no leaking) use. The aesthetics are a little to busy for our taste but the fact we got the crazy blue colour way maybe be a factor in our opinion (simple stainless is mostly likely a lot better). Again the coil design is what it’s all about here. Flavour is pretty awesome really. All that surface area along with really good wicking that leads to a saturated coil delivers a lot of very enjoyable flavour. How it wicks is a bit of a mystery, there are bubbles from below and at the seam where the coil attaches to the chimney. But there is no flooding, which we would expect based on this behaviour. The top airflow is very smooth and not as loud as you would expect from a tank of this size. 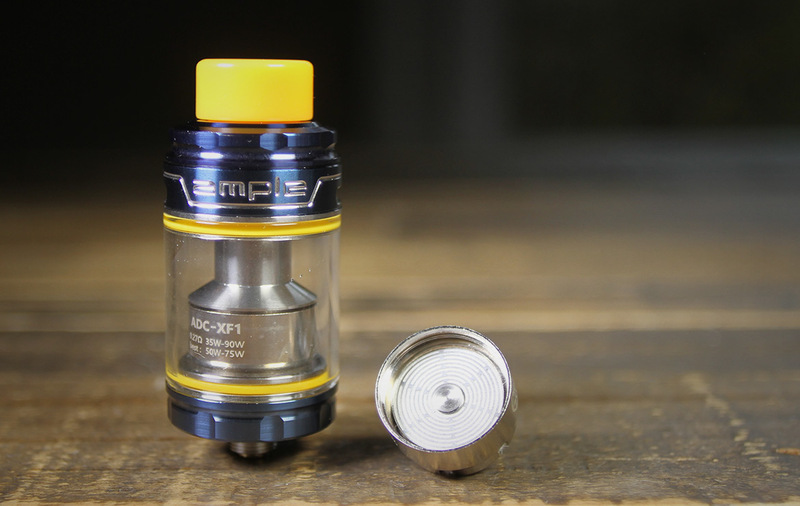 We like the look of the medium size tank (3.7ml) and it’s a nice middle ground for capacity. Closing the airflow down to about 1/3 give us the temp and flavour we are after. We run at about 50-55W to get the most from the coil while being thoughtful about extending coil life. Juice Capacity varies from 2-5.7ml depending on which tank (glass) setup you choose to run. The top fill is easy to use and has large ports. The Coils have an impressive lifespan, easily lasting several days (maybe a week tops). For a tank from a company that we have never heard from its impressive. The coil design is innovative and yet to be copied we think. The aesthetics are a bit of a down fall (had it been a simple clean design, we think it would do much better) and because of the lack of popularity on the market getting coils readily available will be a challenge. So if you want to get a great vape on an innovative coil system you will need to order your setup and a good stock of coils from overseas. That’s just something to think about. This might be one of those products that more BMs should think about stocking. We love to see good design thinking, and the Ample Mace-X has it.